I was quite productive today! I managed to start and complete three projects! 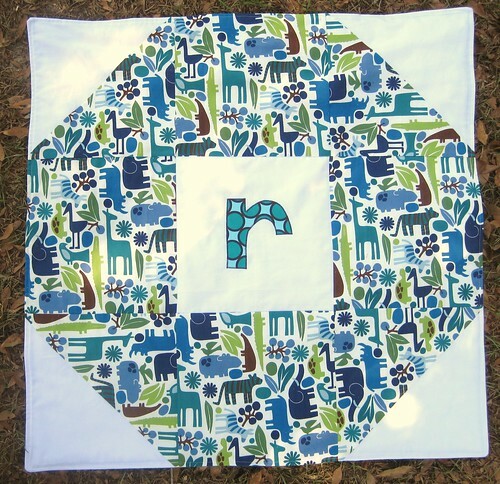 First up is my morning project, a quick kid's quilt for my friend's son who turned 2. She requested no gifts, but I just couldn't stand it! Today was the party so I had to come up with something that I could finish in a couple of hours. This was so stinkin' easy! I've been holding on to that 2D Zoo for a while and this seemed like the perfect time to use it. 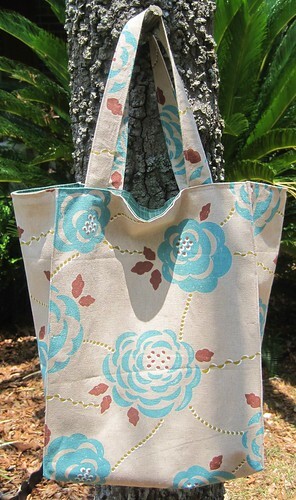 Around lunch time I also made this market bag as a surprise gift for a friend. I won't say who in case she ever reads my blog. The outside is Isso Ecco and the inside is Early Bird. Tonight I decided to get my June bee block out of the way for Twice Around the Block. 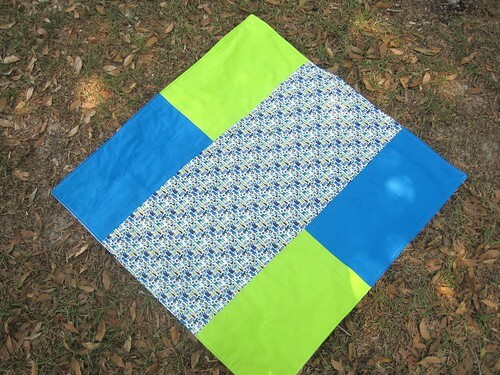 Mary requested any type of triangle block so long as it finished within a 12.5" square. I had no plan with this. I just made a few smaller triangles then had to work out how to make them into a square. Probably not the best idea since I barely had enough fabric! I had to use a little of my own on the ends, but no biggie! In other news, I got approved for another Moda Bakeshop Project! Hooray!!!! Congratulations on another MBS project! Cute block. Congrats on getting to "bake" again! 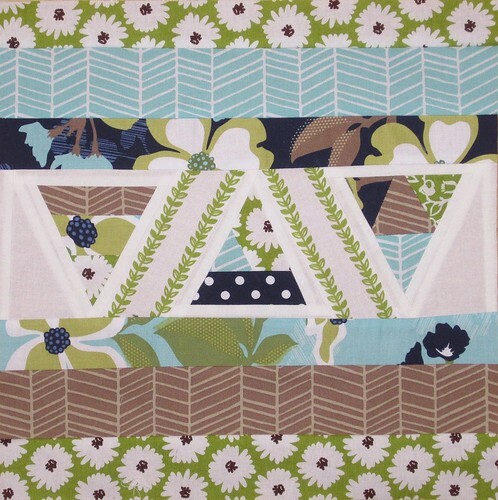 Adorable little quilt, and Love what you did with the triangles! looking forward to your next Bakeshop project. :D Congrats! fun projects Kelly! I need to write up the instructions for my MBS quilt any day now...we finally have the wireless internet working again, so I should have some more time. ;) You'll have to let me know what fabric you got! I don't know if any of you remember the great bee block extravaganza that happened in 2010? This is a wonderful gift for a friend.